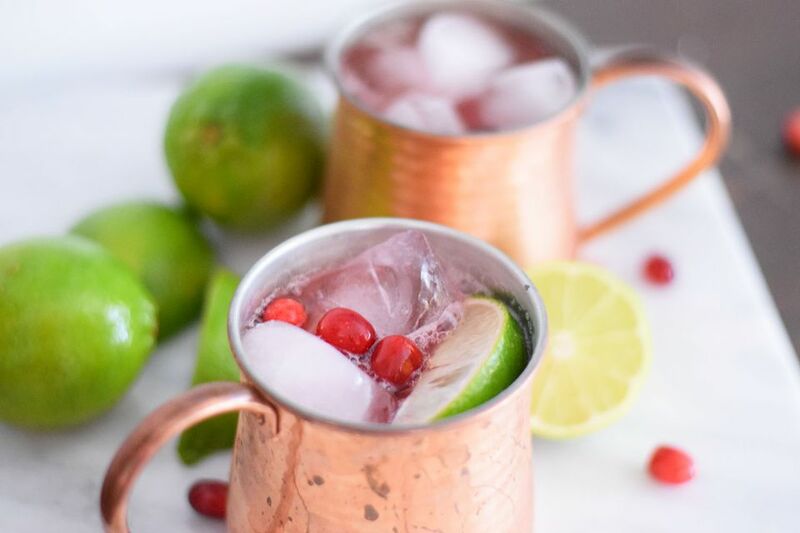 Cranberry Moscow Mules are a crisp and refreshing twist on the classic Moscow Mule. They are perfectly festive and look beautiful on a holiday breakfast table! This cranberry cocktail is so easy to whip up in large batches because they have so few ingredients! You can also make them single serve just as easily. Use a high quality and tasty ginger beer to really put this cocktail over the top. Make sure you enjoy the taste of the ginger beer before adding it to the rest of the cocktail. Sometimes they may be too sweet or too bitter! You can easily make this cocktail virgin as well. Simply omit the vodka! It still tastes delicious and is perfect for young ones and any one who is expecting at the holidays! We love making the homemade cranberry juice with fresh cranberries, sugar, and water. It's very simple to make but does add some time. You have to allow the cranberry juice to cool. While it does provide a tarter flavor and a much prettier color than the store bought stuff, if you are in a pinch, you can easily replace the homemade juice with bottled juice. Just make sure to choose a brand that is full of flavor and is one that you enjoy. This cocktails go beautifully along side your holiday breakfast dishes. It's nice a refreshing, so it goes perfectly with any of your hot dishes! We prefer pouring these cocktails to order. Make sure to not add ice until right before you are ready to serve! The ice can easily dilute the cocktail and take away the magic ginger flavor! Add the fresh cranberries to a small saucepan. Turn on the heat and add the granulated sugar and water. Stir to combine and allow to come to a boil. Once the cranberries are soft (about 5-10 minutes), turn off the heat. Let cool to lukewarm. Strain the cranberries over a fine mesh sieve. Allow the cranberry mixture to completely cool before making the cocktails. Stir the fresh cranberry juice, lime juice, and vodka in a large pitcher. Slowly add the ginger beer and gently stir. If making single serve use about 2 ounces of vodka, 1 Tablespoon of fresh lime juice and top with ginger beer! Make sure to serve over ice in copper mugs! They not only look pretty but keep the cocktail super cold! Garnish with lime wedges and fresh cranberries. Martini, Shot, or Highball...How Will You Take the Purple Haze?